The district straddled the Osage River until the Bowlin District was established. H.E. Brockman, J.L. Brockman, Berry Conner, W.B. Dutcher, J.C. Dutcher, Reuben Dutcher, J.W. Davenport, James Davenport, M. Fitzgerald, Wilson Stoner, John Carroll, William Van, and Jesse Vann. Pleasant Grove School was built in the early 1900's, at its present location. It was first constructed with logs and a few years later it was remodeled with concrete. Pleasant Grove School - Teacher: Swanson? 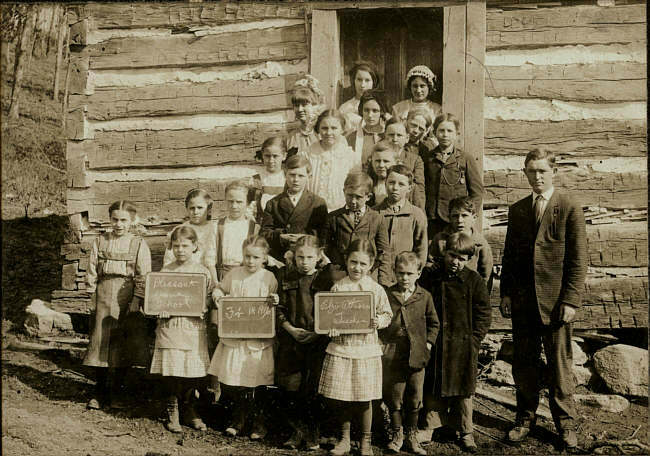 The school started on Aug. 29, 1921 at 8:50 a.m., and the regular school day ended at 4 p.m. The students had 20 minutes for each class, 10 minutes for recess, and one hour for lunch. The school year then was 160-days long. The subjects taught (first grade through eighth grade) were reading, writing, arithmetic, spelling, geography, history and English, all by the same teacher. The first teacher was Mrs. R.D. Kidwell, and other teachers throughout the years were Mrs. Mary Parks, Clara Pope, Tom Pope, Louis Brant, Ila Calcun and Mata Cotton. The library consisted of 260 books, in the first year of existence, and the total value of the library was $125. The total amount spent during the first year for the library was $13.60. The construction of Bagnell Dam caused attendance to drop and the school was closed. 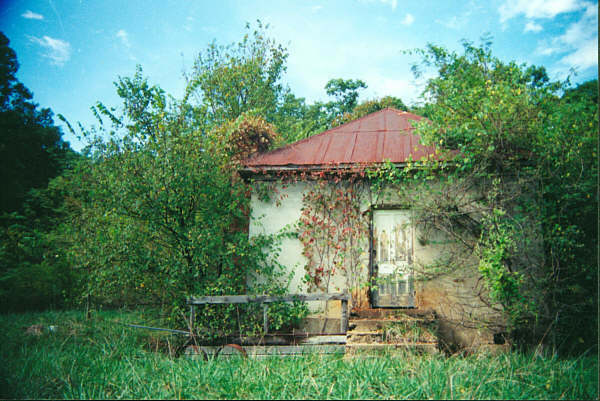 The Pleasant Grove School, also known as the Hog Waller School because there was a small creek near the school house where the hogs had a wallowing place in the summer. 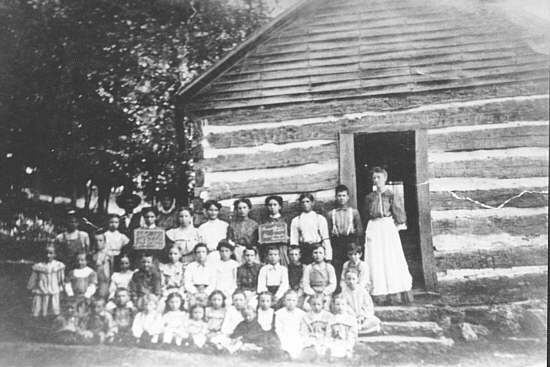 The school house was built of hewed logs. I have not been able to find out just when it was built, but my mother, Rebecca Ellen Conner Strange (born 27 June 1892), and her sister, Alice Conner Strange (born 8 Dec. 1890), both started to school in it. I have a picture of it with mother and her sister Alice holding slates in it but if there is a date on them I cannot read it. I believe it was taken about 1900; Mother said she thought her Uncle Jacob Vann donated the ground for the school. Fern Swanson is the teacher in this picture. This building was used for school and church services until about 1900 when a concrete building was built, and a church house was built nearby. It was called Pleasant Grove Church, and sometimes referred to as the Hog Waller Church. Mother said some boys across the river from it started calling it this making fun of it. The church house which was built nearby was built about 1900 with Elder Benjamin Conner the leader, and with the help of the people in the community donating their labor. It was a frame building built mostly with pine lumber. Benjamin Conner was my mother's grandfather. My mother and most all of her children received their grade school education in this Pleasant Grove School. The school was open until about1935 or 1936, when it was consolidated with the Bagnell School District. They later consolidated with the Bowlin School District and became the School of the Osage. The teachers that I remember are Mary B. Parks, Burley Harvey, Nellie Cotton Jones, Clara Pope, Thomas Pope, Nellie Bunch Conyers, and Lewis Brandt.